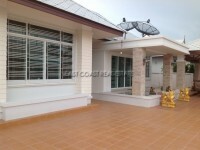 Safe and family friendly village, 3 bedrooms 3 bathrooms, stylish European kitchen with electric cooker. Dining area, living room, storage room, courtyard style rear garden, 2 parking spaces, Full air conditioning, Refrigerator, Washing Machine, Water heater and much more. The property also has a back gate for easy pedestrian access to the Clubhouse and communal pool which are located a short walk away.